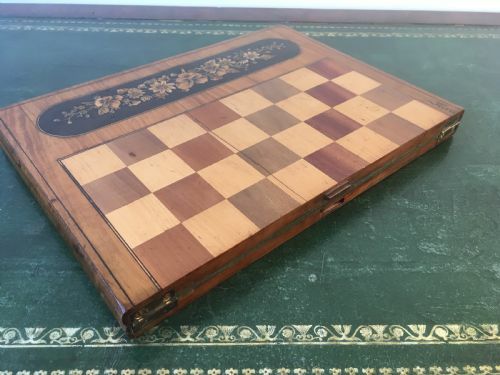 19th Italian Marquetry Folding Chess Board. 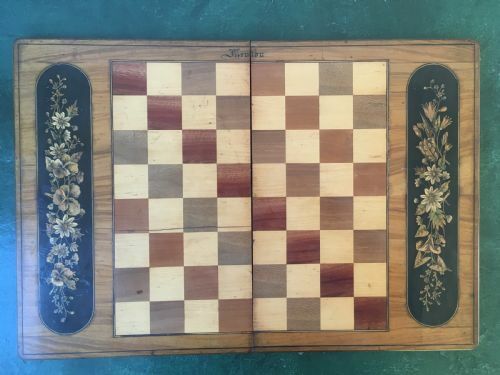 Probably made in Serrento, Italy in about 1870, this beautifully made inlaid chess board is inscribed for "Menton" on the French/Italian border and was presumably sold there as a souvenir. 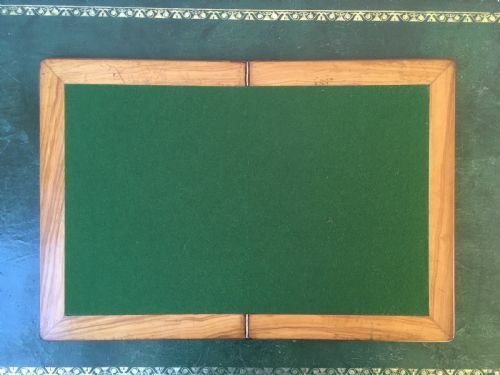 Made principally of walnut, the board is inlaid with boxwood, ebony, mahogany, olive wood and other fruitwoods. 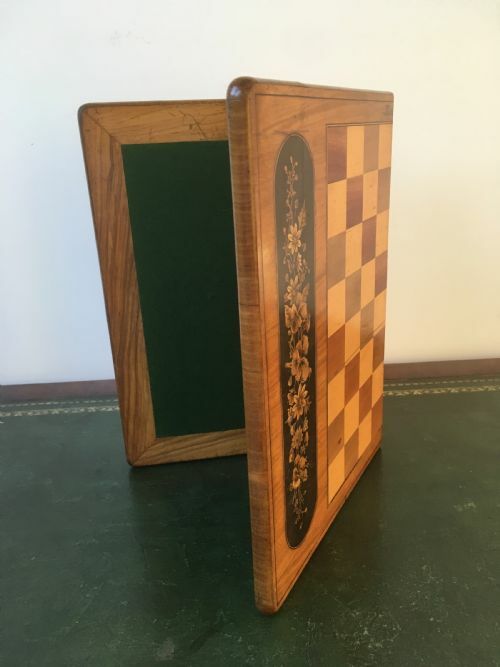 It folds in half, one side being the chess set, the other inlaid with baize as a writing panel. 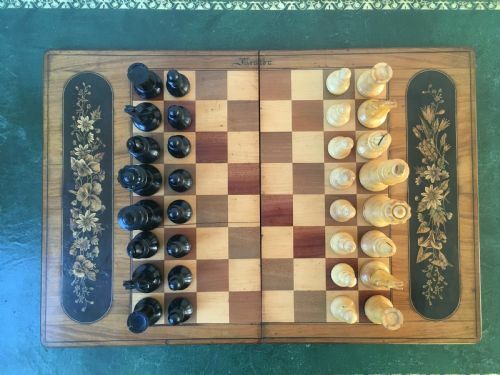 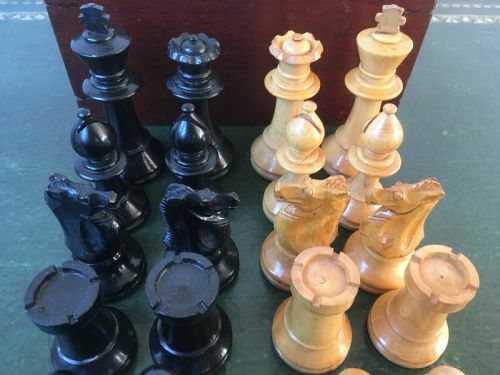 It is in excellent condition and is shown here with a Jacques Staunton style chess set which is available separately. 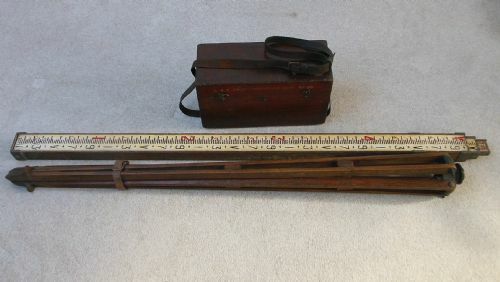 Made by Cooke Troughton & Simms Ltd for the Chief Engineers Department of the London County Council in around 1925 this completely original mahogany boxed builders level with hardwood tripod and extending 14 foot measuring staff must have cost a fortune when it was new. 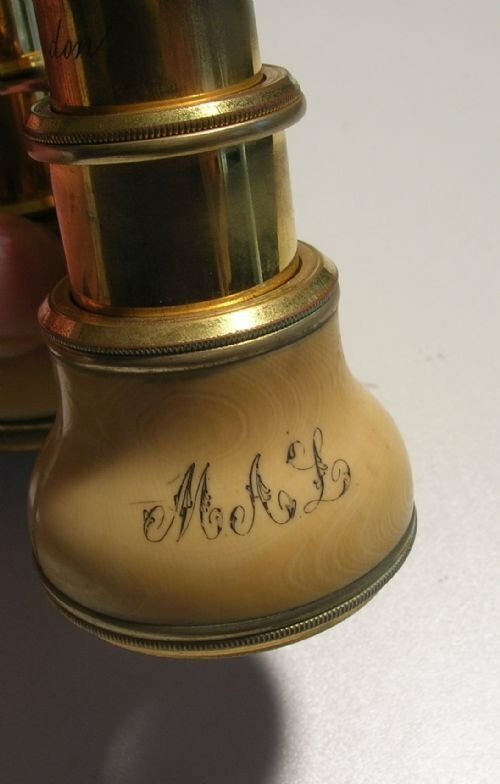 It has service labels for 1930 - 53 on the lid, so if you wanted to recommission it I suspect it might need another. 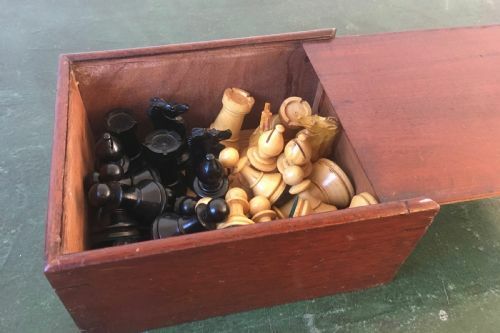 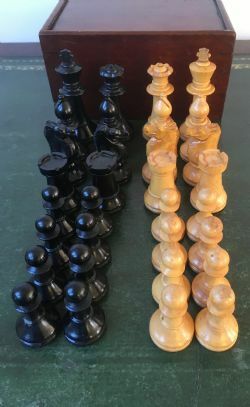 Jacques Staunton style Boxwood and Ebonised chess set in mahogany box with a sliding top. 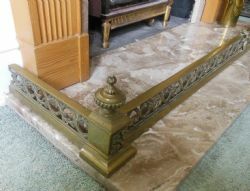 Complete and in very good condition. 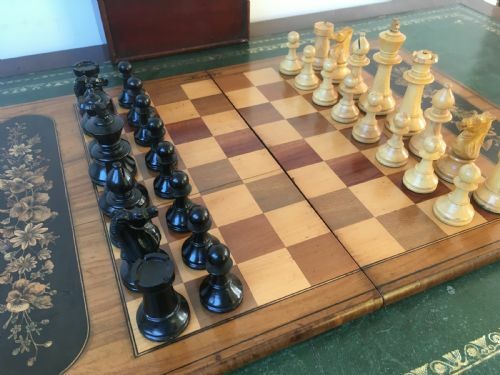 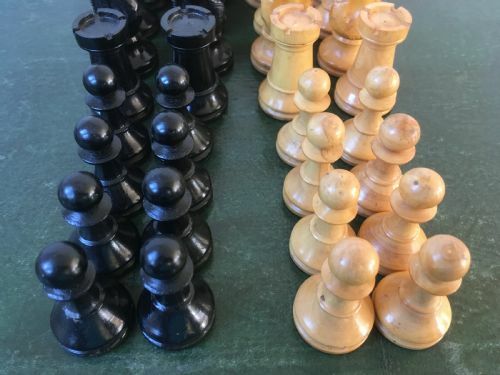 Shown on a chess board and a games table, both available separately. 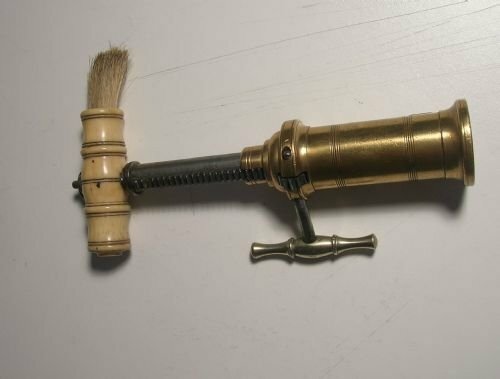 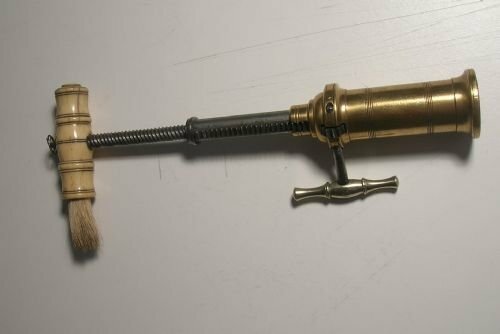 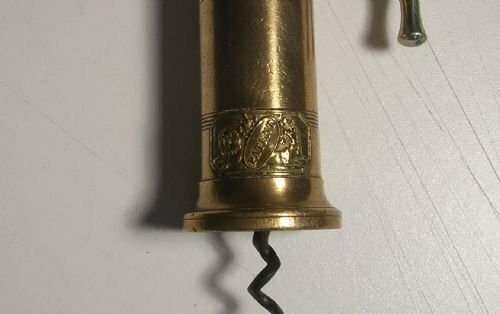 Made in Belgium before 1850 this percussion (or rimfire?) 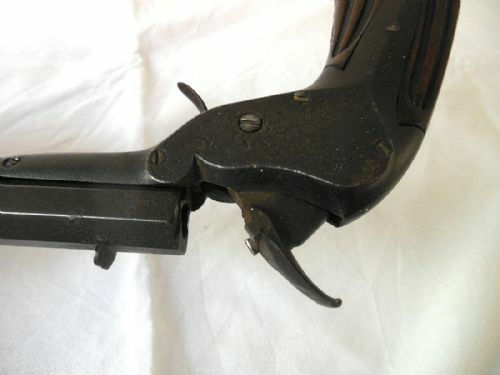 target pistol has seen better days, it is missing the trigger guard and appears to have been modified, but the two position hammer works strongly when fired. 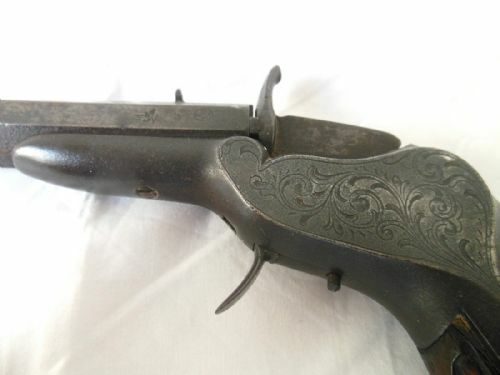 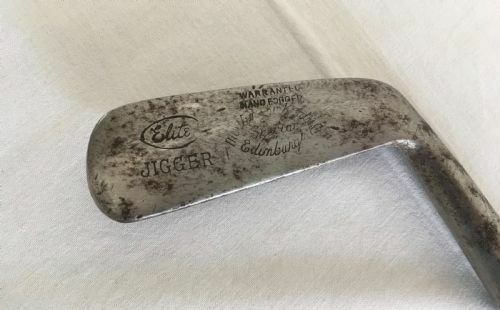 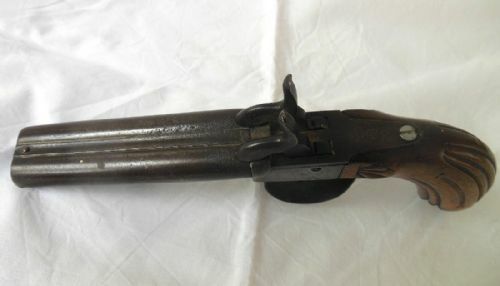 It has the "ELG" proof mark on the barrel and a carved walnut handle. 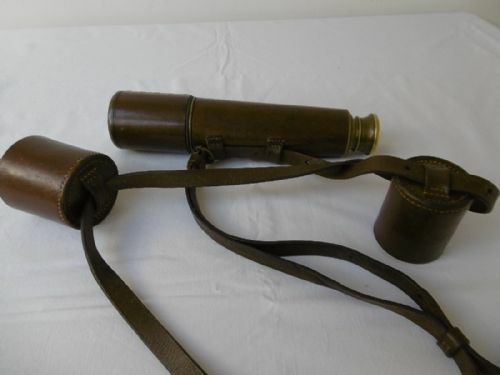 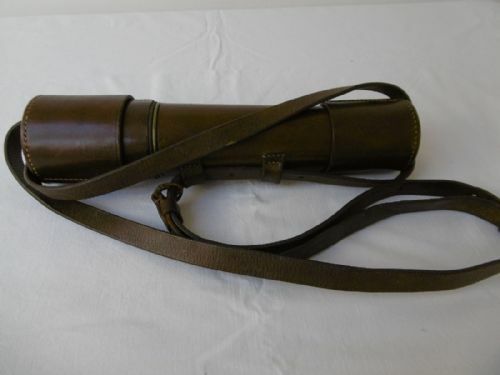 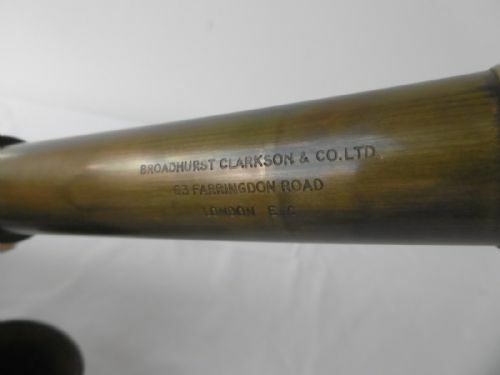 A Broadhurst Clarkson & Co of 63 Farringdon Road London EC1 four draw telescope with full leather bound case and optic guards with leather strap and end caps. 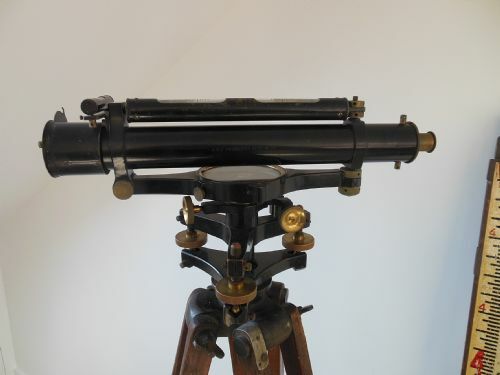 Dating to the first half of the 20th Century this telescope is in excellent original condition with sharp optics and an almost unused leather case. 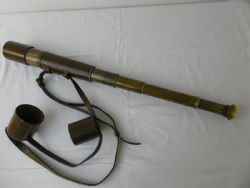 Brass, steel and bone handle. 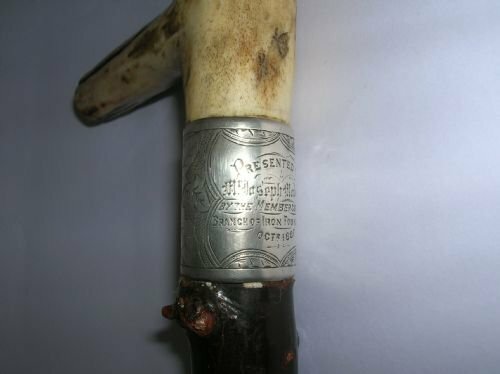 Lion and Unicorn emblem with patent sign. 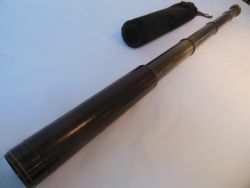 8" (20cms) - 12"(30cms) fully extended. 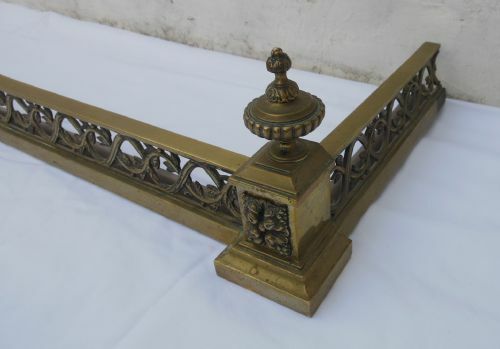 Victorian brass fire surround or fender, in need of a clean and polish but complete and ornate. 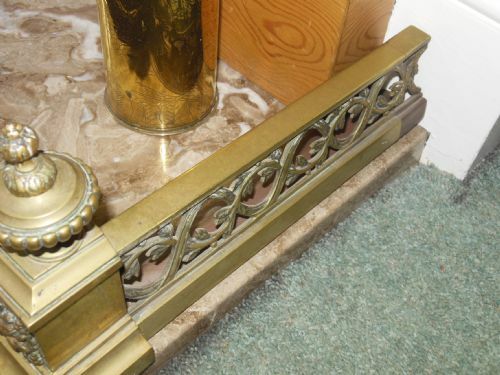 In the classical style with plinth and urns at the corners, a central cartouche surrounded by laurels and a scrolling fence in between. 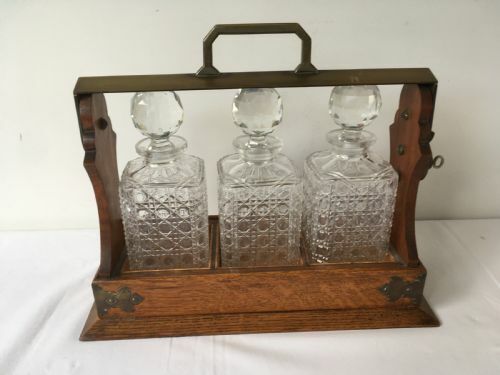 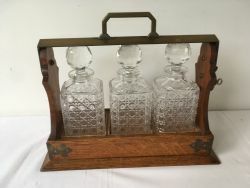 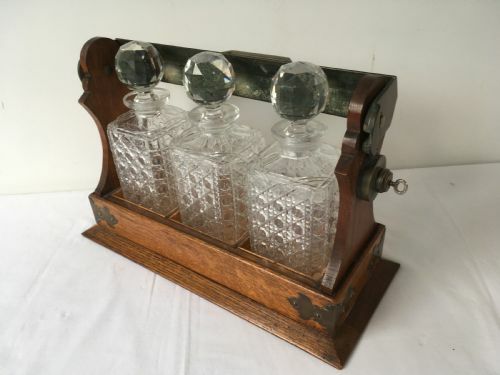 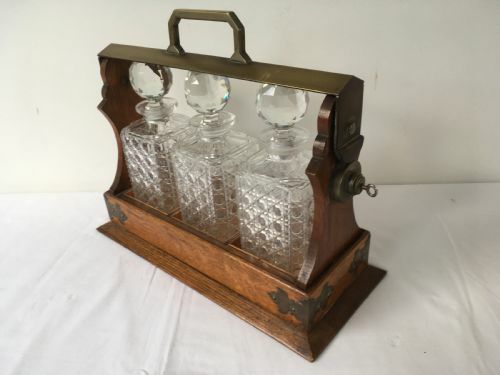 Three Decanter oak tantalus with working key and lock, originally would have been silver plated but now with a faded brass patina. 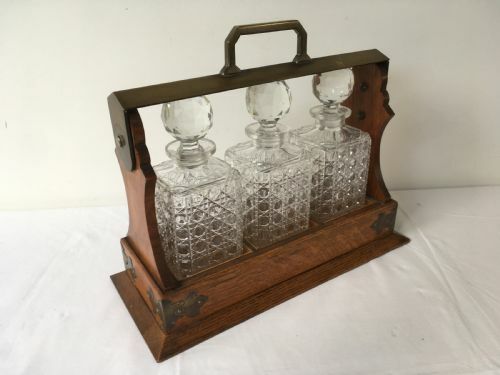 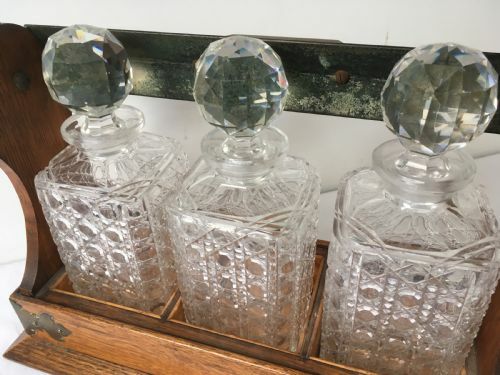 Made by Mappin & Webb during the Edwardian period the decanters are in lovely condition with no chips or cracks, an honest piece. 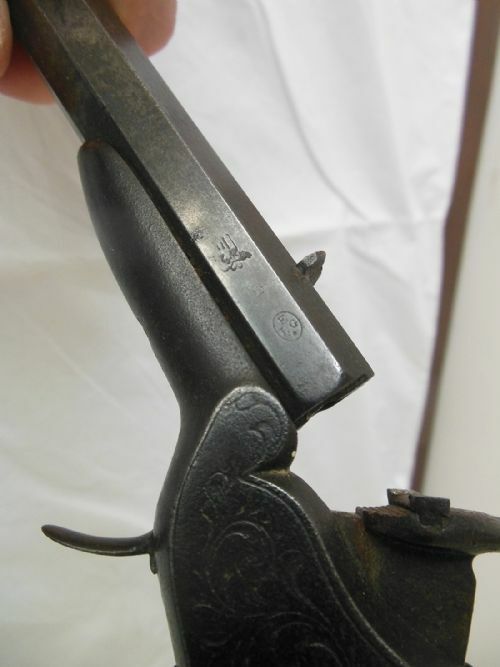 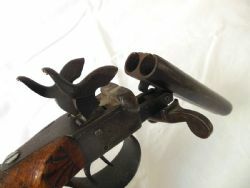 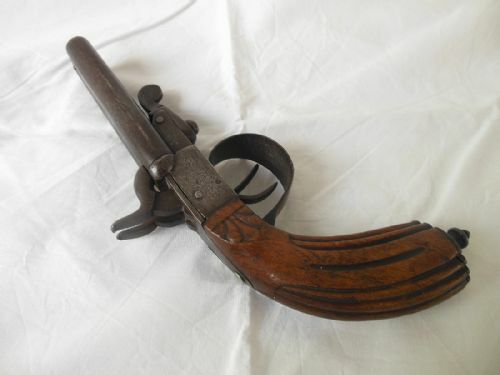 Dating to before 1850, this pocket pistol has had a hard life, a bit bashed, but complete, twin triggers operating twin two position hammers with a carved walnut handle. 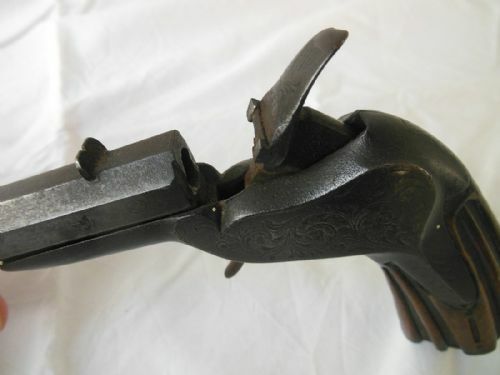 The handle is similar to the other pistol I have for sale so I think this is of Belgian manufacture as well. 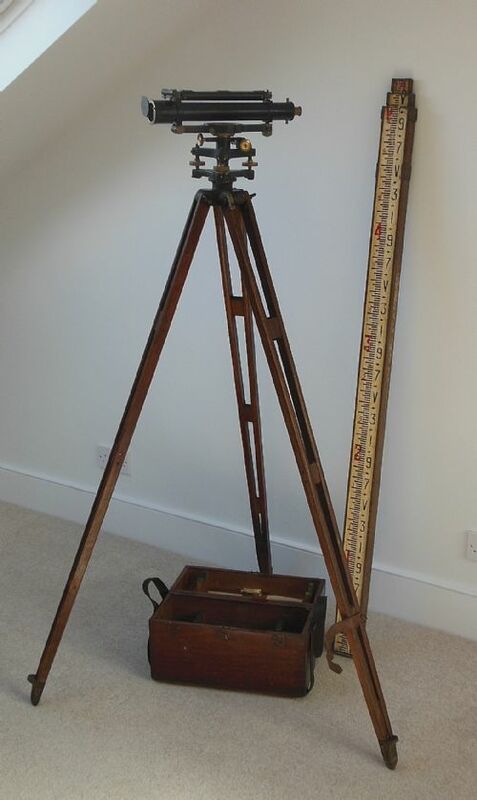 Made in Manchester in 1890 this air meter, wind gauge or anemometer is in original condition and appears to be in working order. 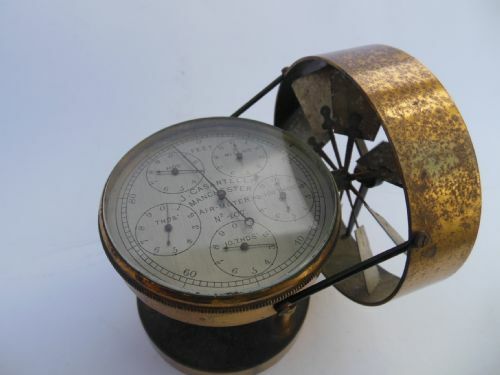 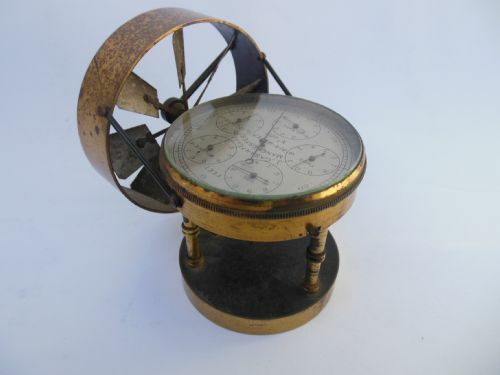 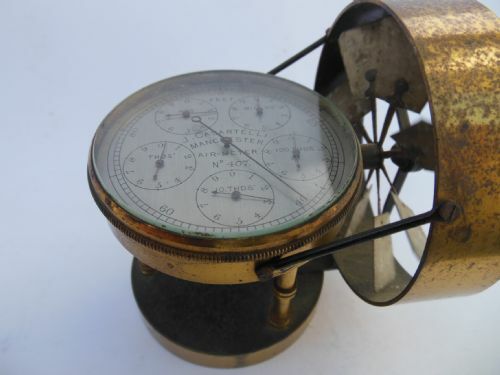 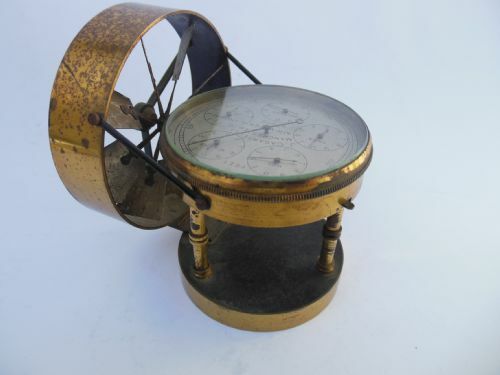 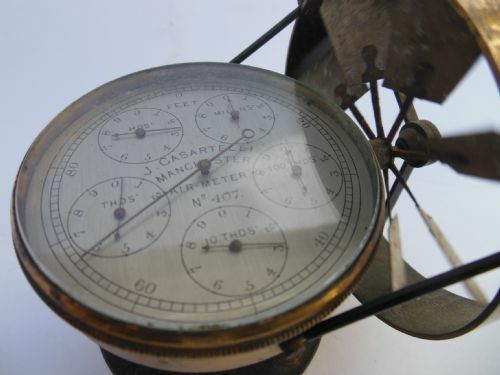 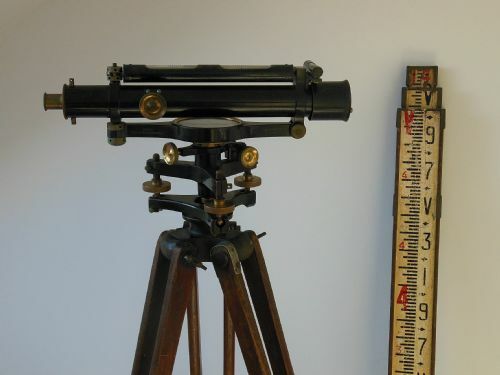 It is marked on the face "J.Casartelli Manchester Air-Meter No 407"
It can be mounted on a tripod as it has a threaded fitting underneath. 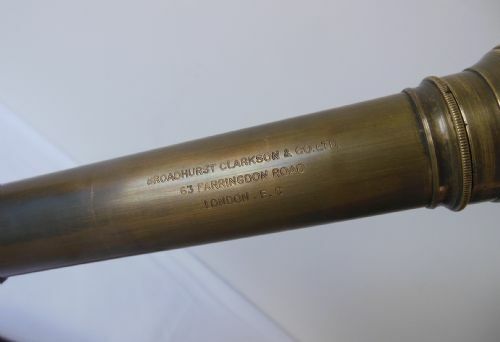 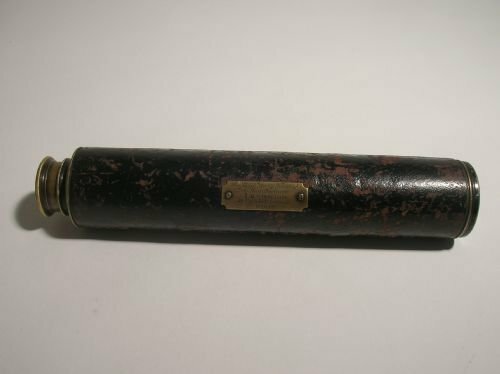 Made in London by Broadhurst Clarkson & Co sometime between 1915 and 1939 this four-draw brass telescope is in excellent condition and in full working order with a suede leather soft case. 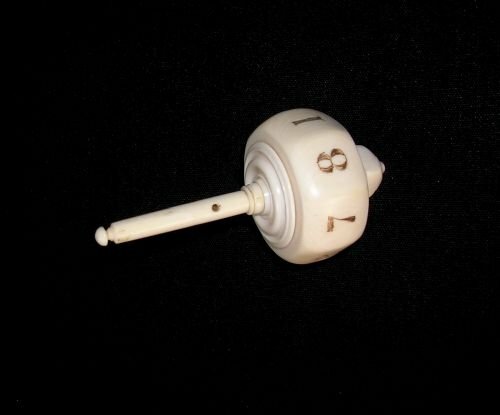 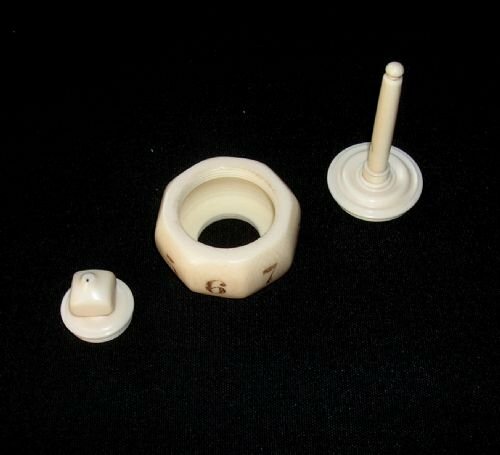 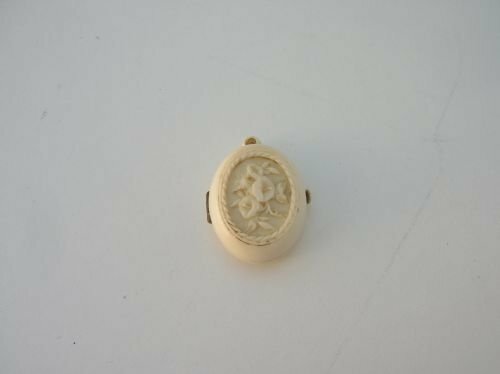 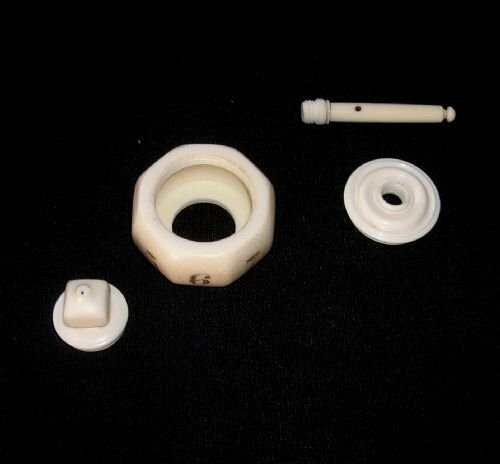 A beautifully crafted ivory spinning top numbered from 1 - 8, breaks down into four parts (see pictures) with a hole in the main shaft persumably for the string. 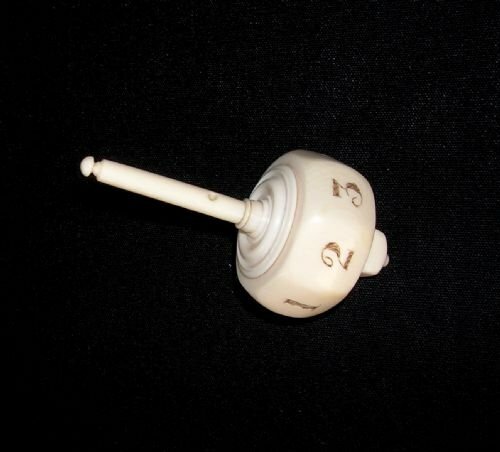 Extremely finely made, well balanced, when spun it keeps going for a long time. 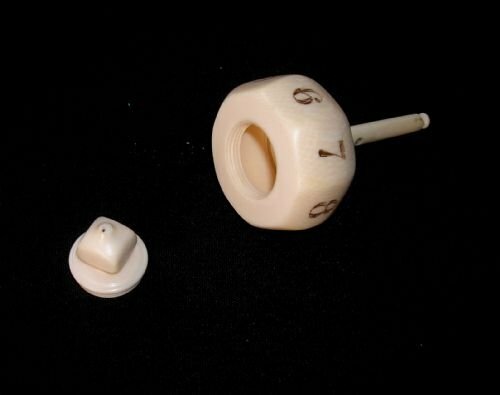 i can't decide whether this is a child's toy or for gambling or gaming. 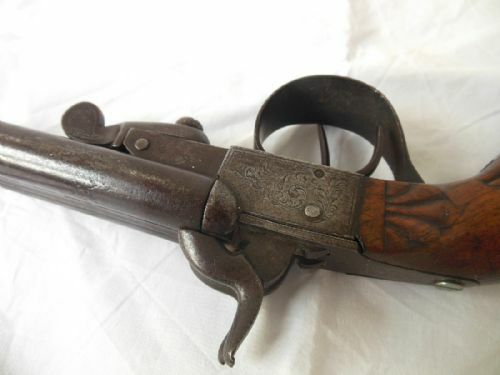 This makes it difficult to date, for that reason I am going for 19th Century, but it could be earlier. 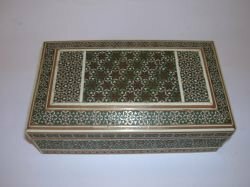 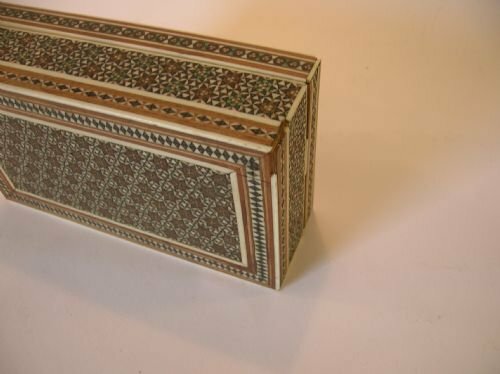 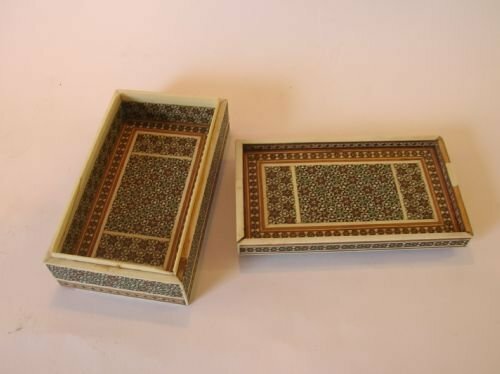 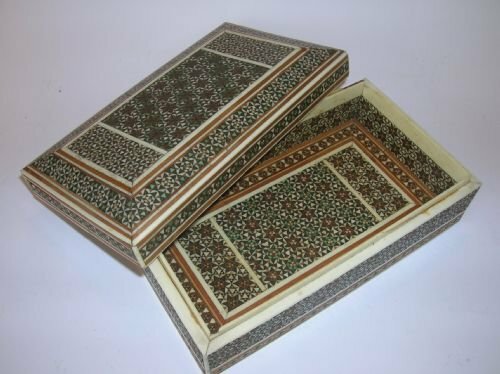 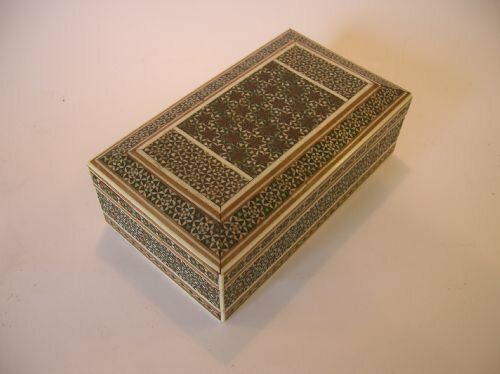 A very attractive Anglo-Indian trinket box in Sadeli work mosaic, with ivory, metal and ebony on a carcase of sandlewood. 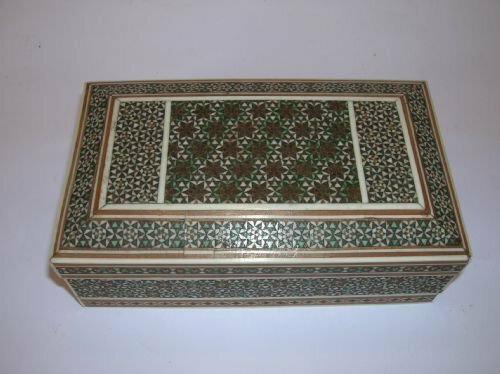 Despite this the work is of excellent quality, with the mosiac covering all surfaces of the box including the base and inside. 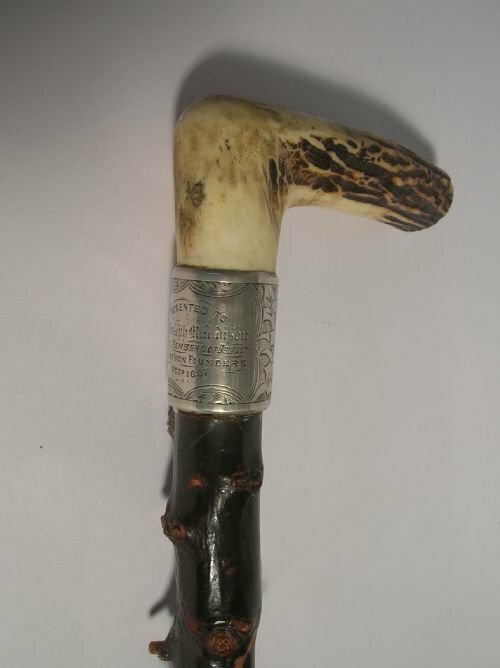 The "Lord Bury" made by J H Steward of 54 Cornhill, London. 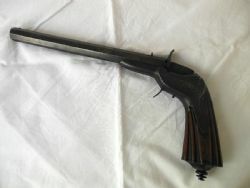 No 618. 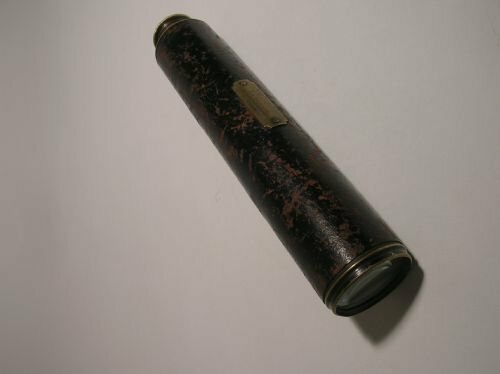 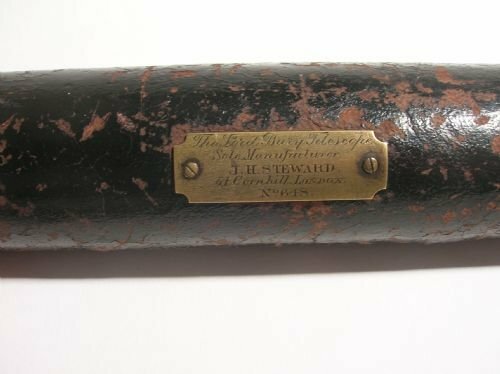 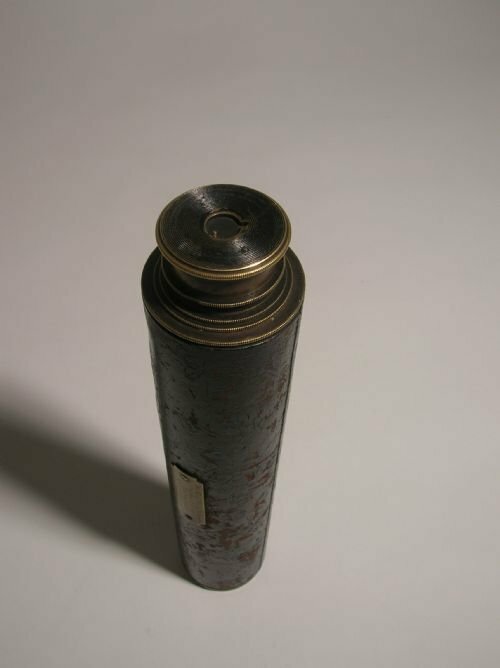 This type of telescope was popular in the last quarter of 19th Century and was named after the Under-Secretary for War, Lord Bury, 1878-80 & 1885-86. 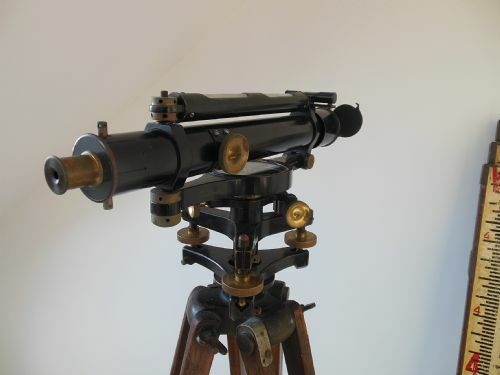 This examp[le is in good original condition with evidence of use, it has a dented final lens with a small chip. 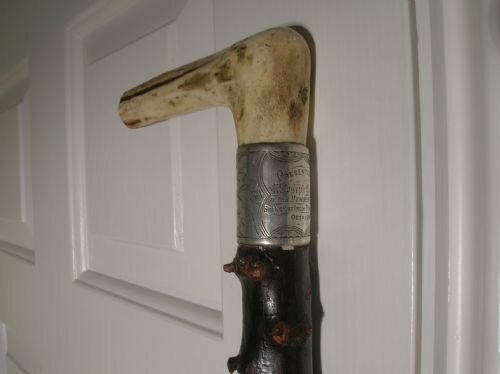 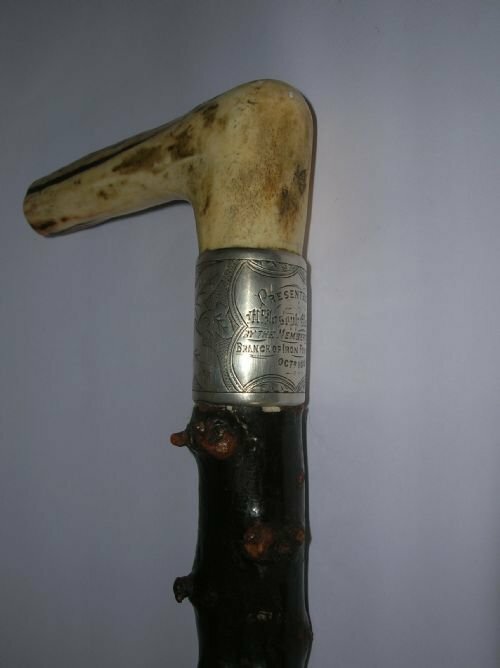 This rather splendid stag horn handled Blackthorn walking stick was a presentation gift in 1867. 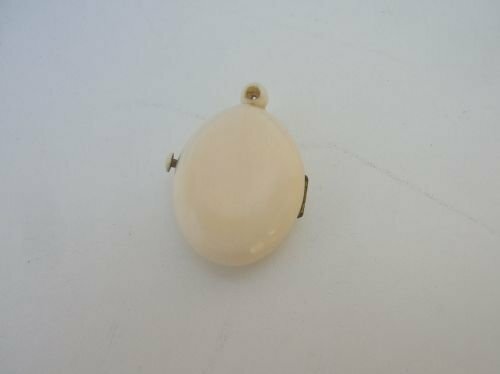 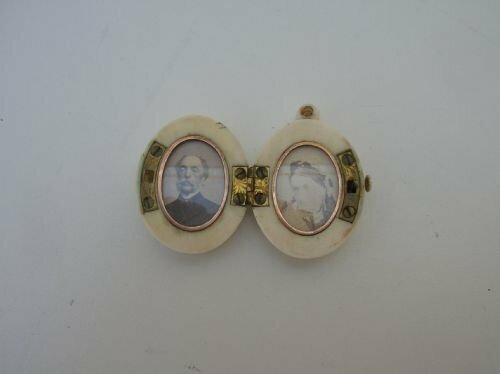 Absolutely stunning tiny ivory locket that opens by a spring loaded button to reveal two rose gold framed photo panels. 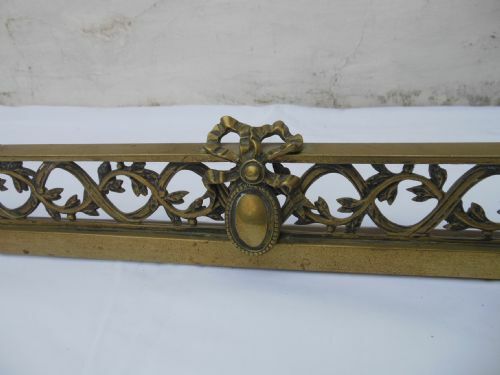 On the front panel there is a beautiful carving of flowers and foliage, the back is plain. 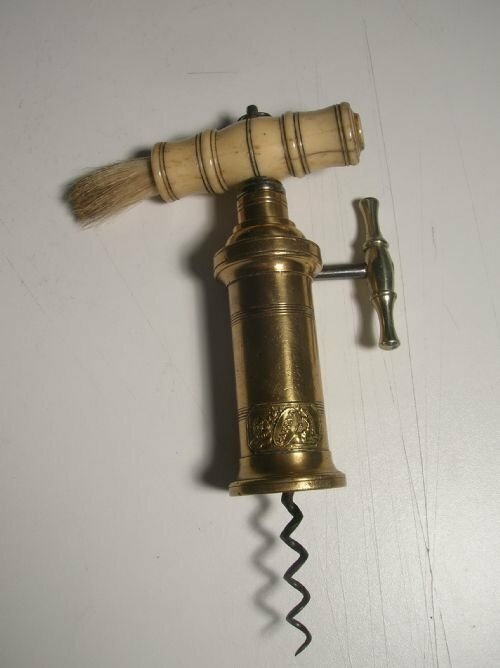 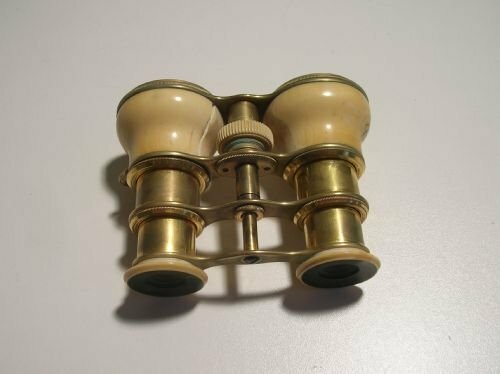 Probably made in China around 1875. 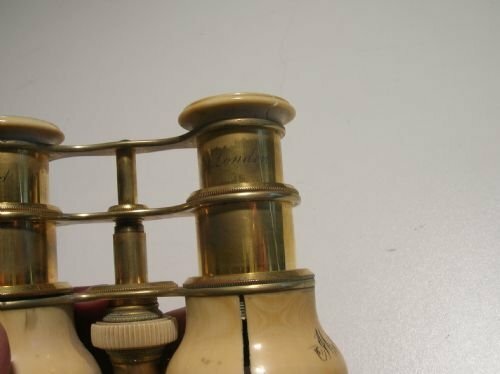 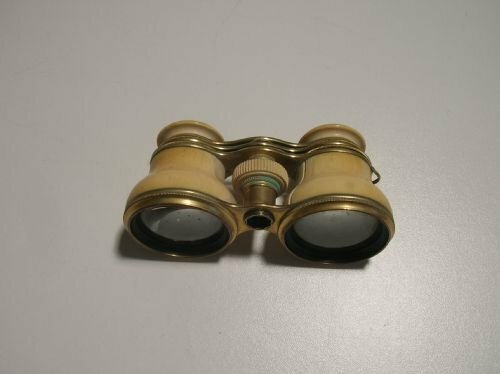 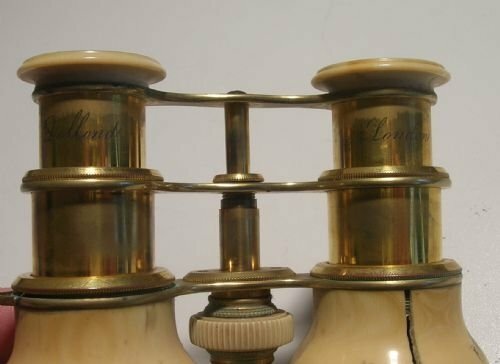 A pair of brass and ivory opera glasses marked "Dolland" & "London"
probably made at the end of the 19th Century there is an inscription "MAL"